Sea Buddies™ Daily Multiple / 60 chews Tropical Splash - Nature's Way®. Why should children use multivitamins? Many children don't eat as well as we'd like them to, and have nutritional gaps in their diets. Multivitamins can help fill those gaps. 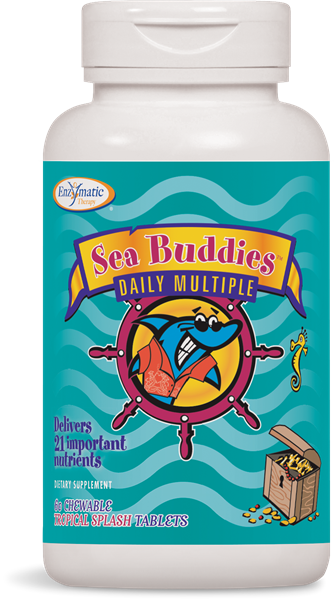 Why choose Sea Buddies™ Daily Multiple? The delicious Splashberry and Tropical Splash flavors have even been approved by kids! However, parents will love the fact that these flavorful chewable tablets have the least sugar of any leading brands. Children age two to less than four years: chew 1 tablet daily, or as recommended by a healthcare professional. Children age four years and over: chew 2 tablets daily. If taking any medications, consult a healthcare professional before use. See the label for Percent Daily Values (DV) for children age 2 to < 4 years (serving size is one tablet). Sea BuddiesTM daily multiples come in two flavors: Splashberry and Tropical Splash. Why are the formulas and the daily dosages different? Are any ingredients in Sea Buddies Daily Multiple derived from nuts?